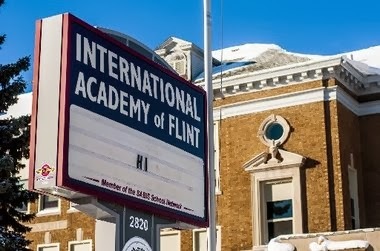 GENESEE COUNTY, MI – Art Wenzlaff says consistency has been key for International Academy of Flint in gathering recognition for its educational program. International Academy of Flint topped Genesee County schools on Bridge Magazine’s Best Schools statewide rankings released Tuesday, Jan. 28 -- coming in 12th out of 540 districts -- while other local districts find themselves in the lower half of the statistical analysis. Davison was the next closest finisher in Genesee County, ranking 35 out of 540 districts across the state. Grand Blanc, Carman-Ainsworth and Montrose rounded out the top 5 finishers in the county. He also gave credit to employees in the district. "We have a great staff that believes in and practices our ‘kids first’ philosophy along with supportive parents, businesses and a community that truly make Davison a destination school district.” Near the bottom of the list is Westwood Heights at 474, Madison Academy in Flint at 489, Genesee at 496, Flint at 511 and Beecher coming in at 535. Beecher Superintendent Josha Talison said part of the key to make schools there better is a focus on improving the system of teaching and learning, along with showing their improvements to people who may be looking for a school to send their children. Talison noted some of the changes in the educational system at Beecher have included moving toward a common way of teaching and trying to align to common core standards, as well as documenting student growth and in-house quarterly assessments of staff and a partnership with the University of Michigan-Flint. "Parents do that, they should around and look at numbers," he said of test scores, adding it is a number-driven society, and "Until we get those standardized test scores up, people are going to say you are 535 out of 540." A Flint schools spokesman could not be reached for comment Monday, Jan. 27. The report factored in standardized test scores from the past three years -- MME, MEAP and ACT -- as well as the number of students receiving free or reduced lunch. Of the accolades for International Academy, including placement in the top-10 of Bridge's 2013 rankings, as well as the high school being named one of the best in the country by U.S. News & World Report, Wenzlaff said, “We are very proud of any designation that we get." "It’s a big deal. By no means does that become old hat. We share that information with our kids and our parents,” he said. Wenzlaff said the parents at International Academy, a K-12 school on South Saginaw Street of more than 1,100 students, “play a major role in any award that we get.” The parents create a connection to education once children leave the building and continue learning at home, he said. He noted the school is also flexible in terms of changing up curriculum, which Wenzlaff said is college preparatory “all the way from the little guys to seniors.” Students must submit an acceptance letter to an institution of higher learning before they graduate.